Some comebacks save the day. When a day needs saving, that usually feels like enough. This one was better. This one might have salvaged a season. It is impossible to overstate just how important Sunday's roar-from-behind 24-20 victory over Minnesota was for Tampa Bay. Yes, coming back from 17 points down provided the Bucs with their first victory of the season, which was a grand enough achievement. By the end, however, by the time the Vikings trudged off the field wondering what happened, it felt bigger than a single game. As comebacks go, this one felt like Lazarus coming back from the dead and catching a pass for a first down. It felt as if someone had found an unplugged cord and reinserted it into the socket to make the power come back on. It felt as if, dare we say it, a team had rekindled its energy, recaptured its identity and restored its fans' hope. Most of all, it felt as if the Bucs are going to be interesting after all. Though for a while, it didn't look like it. For the first half of the game, the Bucs were so dreadful that fans could be forgiven if they wished to take back anything good they had ever said about this team. The Bucs could not block or tackle or catch. They were a casting call for The Walking Dead only without so much walking and more standing in place. Zero points. Three first downs. Twenty-three yards rushing. Consider this: In the first half, the Bucs ran exactly one play from scrimmage in Minnesota territory. It was a punt. At halftime, the Bucs were staring into the darkness. It is one thing for a team to be 0-2. It is another to be 0-2 without a spark of energy. If you had to swear to it, you might have believed the goal here was not to catch New Orleans and Atlanta in the NFC South; it was to catch Carolina. Then came the second half, and everything changed. A brief intermission, a little yelling by Raheem Morris, and the Bucs remembered who they were. After that, they were bold. They were daring. They were dangerous. After a one-sided first half, this was so other-sided that it left Vikings fans pulling on those little Swiss Miss pigtails that many of them seem to wear. The women, too. Once the Bucs got going, it didn't matter that Josh Freeman threw an interception at the goal line. It didn't matter that a touchdown pass to Mike Williams was called back because of a penalty. Nothing mattered. "That was the first time we've played Buc ball all year," said tackle Donald Penn. "That was us," said Freeman. For the Bucs, that was almost as important as the victory. They returned from the land of the lost. They remembered who they were and how they have to play to be successful. That had been the conversation Saturday night at the team meeting. Offensive coordinator Greg Olson kept saying, "We have to rediscover our identity." A week ago against Detroit, they had lost some of that. The Bucs didn't have enough faith in their base offense, and they went to the two-minute version too soon. It made the fourth quarter a little more interesting, but the truth of it is that the Bucs won't reach the playoffs in the no-huddle. If they are going to be successful, they have to have LeGarrette Blount wading through defenses the way he did in the second half when he rambled for 67 yards. When Blount is rolling through a secondary, there is an energy that spreads throughout his team. If they are going to be successful, they have to contain opposing offenses. They are young, and they are inexperienced, but they are what the Bucs have, and they have to learn on the run. Consider this: During Sunday's first half, Adrian Peterson averaged 5.5 yards per rush. During the second, he averaged 3.7. If they are going to be successful — and yes, you have heard this before — Freeman has to continue to hold the deed to the fourth quarter. This time, Freeman was 8-of-11 in the fourth quarter for 99 yards. He has done it before. In Freeman's first start, he came back from an 11-point deficit to beat Green Bay for the Bucs' first win of the season. 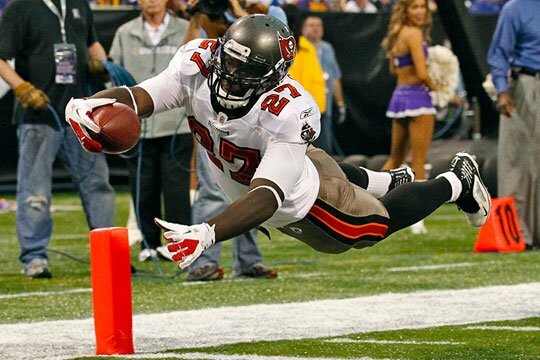 Later that year, he helped the Bucs come back from 17 down to beat an excellent New Orleans team. Last year, he led his team from 14 down to beat St. Louis. This beat them all, however. The Bucs scored two touchdowns in the final 81/2 minutes. The Bucs ran 17 plays on those drives, and 11 of them gained 5 yards or more. By the end, you had the feeling the Bucs could have driven to Canada if they had needed to. This time, they came back from a deficit, and from disappointment, and from disarray. This time, they came back from their flaws and your frustration. Now, they have to come back and do it again. A few more agains, too.